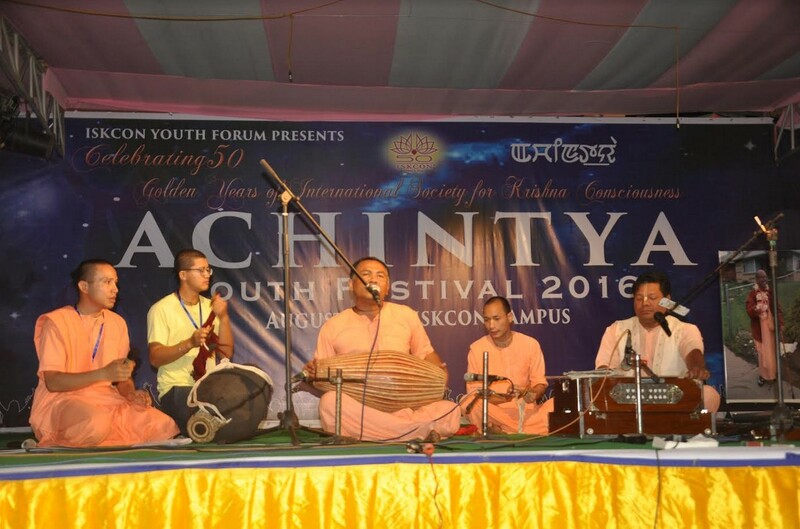 Including Manipur ISKCON in the worldwide celebration of 50 Golden years of ISKCON, the Youth Forum of ISKCON Manipur organized ‘The Achintya Youth Festival 2016’, from 21st to 24th August 2016 at the temple premises and was completed successfully. A festivity replete with cultural programs, musical performances, debate, quizzies, interesting competitions, interaction with distinguished professors, social workers and celebrities, martial arts presentationa, kirtans, prizes and to complete it all…extraordinary mahaprasad for all….altogether made the event memorable. As a prelude to the festival a photography competition was held during the ratha yatra festival with a theme ‘ratha yatra in Manipur’, jointly organized with the Manipur Photography Club. An open essay competition on the topic ‘Spirituality is the Ultimate Solution to All Material Problems’, and a painting competition on the theme ‘Krishna Lila’, for classes 6th to 12th was also organized on 14th August 2016 with an attendance of more than two hundred students. The first prize for the essay competition went to Kavita Kancahan Ningthoujam of DM College of Arts and for painting competition, Telen Khaidem of DAV Public School bagged the first prize. A state level open debating competition was also held on 21st August 2016 on the subject ‘Communal Harmony is Possible Only through Interfaith Dialogue’, which was presided over by Dr. I. Ibohalbi Singh, MLA leader of opposition; A. Mubi Singh, President, Editors’ Guild and His Holiness Bhaktivyasa Tirtha Swami, ISKCON Guru and Sannyasi. The first prize for the debate was awarded to Mr. Misban Hanif of Modern College. It was very interesting that students from all different faiths came and took part in the events which in itself served the purpose of the festival…’going forward together as one community, promote open mindedness and creative thinking, and generate an awareness to be successful in life both materially as well as spiritually.’ The famous Gaura Lila of Manipur was also enacted in the evening to the pleasure of all. 22nd August- interactive program on ‘ womens’ role in upliftment of Manipur Society.’ The discussion was headed by Dr. Ch. Jamini devi, former Chairperson Manipur State Women Commission, retd. Principal DM College of Commerce. Rains arrived early morning on 23rd August drenching all hopes of the devotees but students started to pour in and within no time around six hundred students packed in within the pandal. The festival on the theme ‘Science of Happiness’, started with cultural programs, interaction with Professor W. Nabakumar, Department of Anthropology, Manipur University and Professor S. Ghosh of IIT Kaharagpur, questions and answers, scientific movies, ISKCON movies, martial arts performances for very young yet extremely talented children. The traditional dances based on the padavalis of our vaishnava acharyas captured the hearts of all. Students also enthusiastically participated in the interactive quiz, on the spot photography contest, slogan writing contest. The first prize of the quiz went to N. Ruchita Devi of Manipur University; for Slogan writing contest Kavita Kanchan Ningthoujam of DM College of Arts was awarded the first prize. A free medical camp was also organized by the ISKCON Nature Hospital. Again the evening was clourful…performances by expert artists on traditional Gaura lila entitled Nitya Lila which depicts the pastimes of Sri Chaitanya Mahaprabhu and Abhiram Thakura: Sridama Sakha, appeared as Abhiram in Gaura lila joined to play hide and seek but he remained hiding only to come out in Kali Yuga where Nityananda Prabhu brought him to meet with Mahaprabhu. Another dance drama entitled ‘Kamsa bodh’, or killing of Kamsa. An unexpected indefinite bandh was called starting from 24th August…again drenching all hopes in full despair…as the sun came out bright..leaving aside the rain clouds…hopes also started to sprout new leaves. Students started to arrive in very small numbers. Devotees decided to have kirtan as there was nothing else they could to do to make the situation better…more and more students and performance artists started to arrived and so did the visitors along with more students. Krishna Sudama Das led the kirtan. The day’s theme was ‘Exploring Mind’s potential.’ Cultural programs starting from local folk dances of Manipur to intricate dances of Krishna or Gopis depicting the geeta- govinda, violin performances, ballet and martial arts show made the festival very lively. Students also very enthusiastically interacted with Professor Ghosh asking him many questions. There was a contest on picture guessing and sound recognition. The first prize went to Amit Laishram of LMS Law College, Imphal. Vasanta Rasa…which is a famous part of the all famous Manipuri Rasa Dance was performed as well as Krishna Lila. How the whole festival went on so smoothly was something completely beyond our wildest dream or expectations. We sincerely thank the students of LMS Law College, DM College, Manipur College, Imphal College, Manipur University, Manipur Public School, Modern college, Comet School, Maria Montessori School, HRD Academy, MEM Hr Sec. School and Bhaktivedanta Institute Mission Higher Secondary school, NIT Imphal and many more reputed institutes for kindly taking part in the festival. The team of the organizing committee would like to thank all the wonderful members of the team. 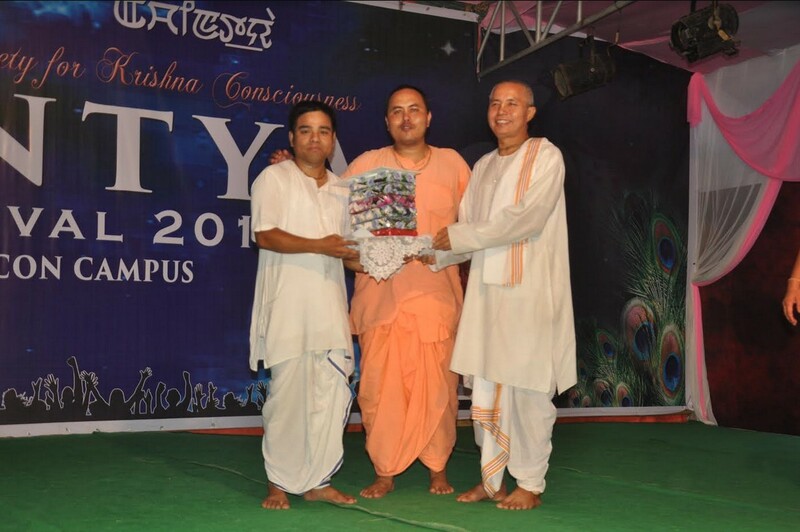 Also we would like to thank H. H. Bhaktivyasa Tirtha Swami: HG Ekanath Das, Zonal Secretary of ISKCON; HG Radhacharan Das temple president of ISKCON Manipur along with all the devotees involved; also our gratitude goes to HH Gopal Krishna Goswami Maharaj, the GBC of Manipur for his continuous support for the festival. Our obeisances to Srila Prabhupada and Srila Bhaktiswarupa Damodara Svami for their unlimited blessing upon all the devotees.